Web design and technology has come a long way since the 1990s, but Marvel Studios has turned the clock back for the official Captain Marvel site. Instead of flashy high resolution images, we are treated to pixelated versions, which perfectly reimagines the 1990s websites. There's a lot of Word art, a ticker to count how many unique views that the site gets, a guest book, and even a game that lets fans spot the Kree. Instead of the trailers coming through YouTube, they are played using the "Kree Player," which is take on the old Real Player. The guestbook has been filled out with a bunch of references to the 1990s, including the dancing baby craze and the Y2K bug that had the world ready to melt down. Adding to the fun is the top secret portion of the Captain Marvel site, which features Samuel L. Jackson's Nick Fury in some low-res images along with an animated gif of the character reaching down to pet Carol Danvers' cat Goose, who's real name, Chewie, is mentioned in the guestbook portion of the fun new site. Goose is reportedly the secret star of the movie. Captain Marvel hits theaters on March 8th, which means that spoilers and trolls will be out in full force over the next few weeks. Make sure to stay away from certain places on social media to ensure a spoiler-free viewing experience. With that being said, MCU fans are dying to know how Carol Danvers will be introduced and how she will ultimately fit into the upcoming Avengers: Endgame, which will close out Phase 3 of the MCU. There's a lot of mystery surrounding the character and her immense powers. Thankfully, the wait is nearly over. 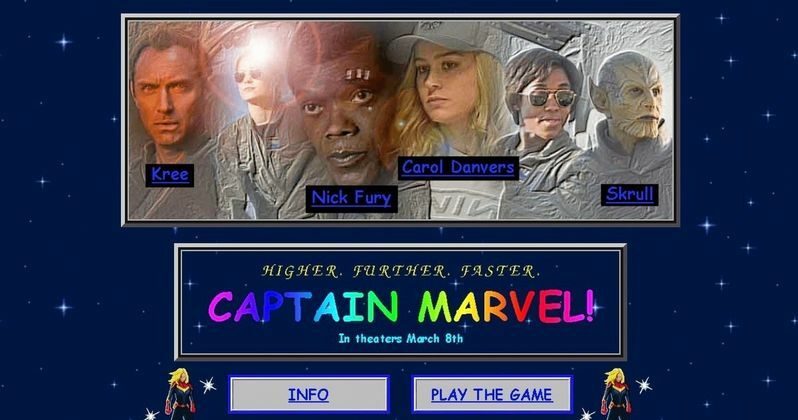 While we all wait for Captain Marvel to hit theaters, you can head over to Marvel for a 90s internet nostalgia trip.